Long story short, UK film-photo blogger Dan James offered to send me 25 rolls of Agfa Vista 200 he bought for £1 each at Poundland, which is to the UK what the dollar store is to the US. Poundland has since stopped selling the stuff, to the anguish of film shooters across the sceptred isle. Dan offered in the nick of time! And Agfa Vista 200 is just Fujicolor 200 in disguise. That’s my everyday color film! Even after I reimbursed him plus shipping, each roll was far cheaper than I can get Fujicolor 200 here. Win! While I did see solid results on several frames, many others were a little disappointing. But I don’t think I have my scanner and my Silverfast settings sorted after my computer’s hard drive committed seppuku recently. Scanning is fussy enough even when the Silverfast settings are perfect. So I’m reluctant to pass negative judgment on this film. Still, the shots that hit, hit big. Glory be, yellow! I don’t know of any other negative film I’ve tried that captures yellow worth a damn. This alone makes it a shame that Fujifilm discontinued this film. 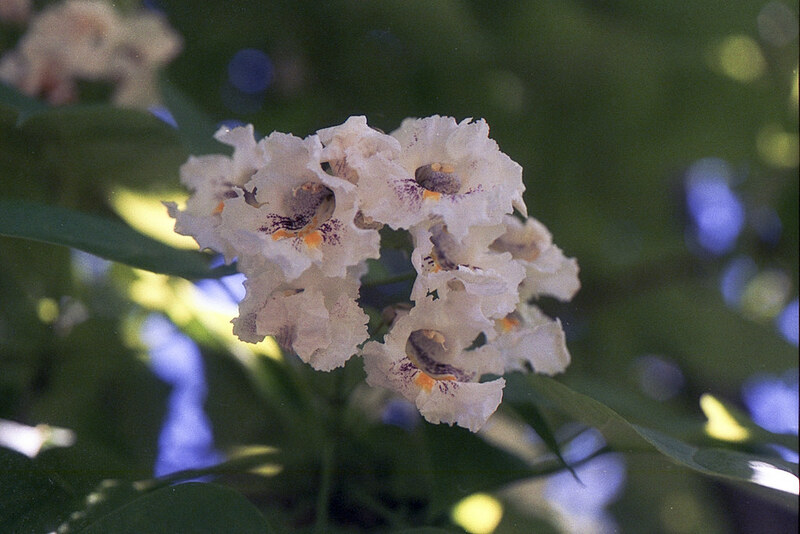 After having the mini-forest of dead ash trees removed from my yard two years ago, two catalpa trees tucked in corners of my property have begun to spread. Their blooms don’t last very long. I was very happy to have noticed them. When I bought my house I was not thrilled it had a deck. My head was filled with visions of power-washing and re-staining it every few years. Ick. Turns out the one time it needed done I was able to pay someone for the job. Otherwise, it’s been lovely to sit out here on cool evenings and take in sunsets. 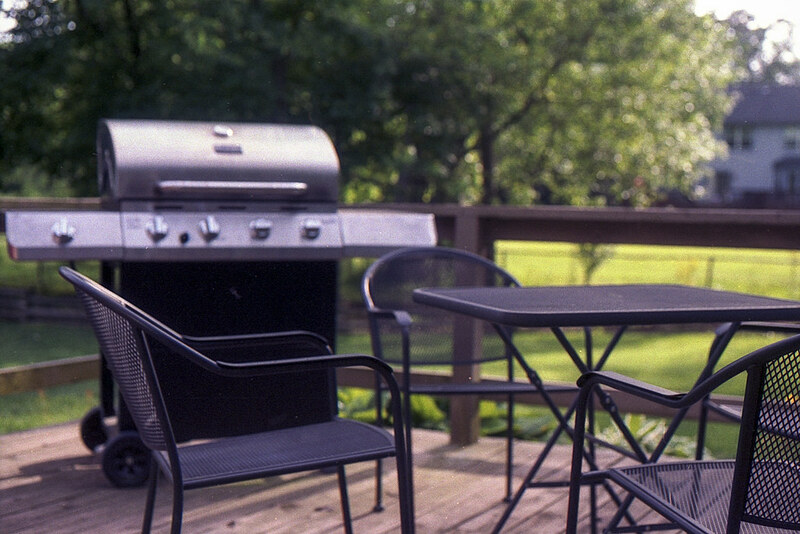 The Superia 100 returned true-to-life color here. Spot on. Here are a few shots that don’t impress me much. Perhaps I was still wrestling with Silverfast’s settings. I don’t know. All I know is that the colors are meh. 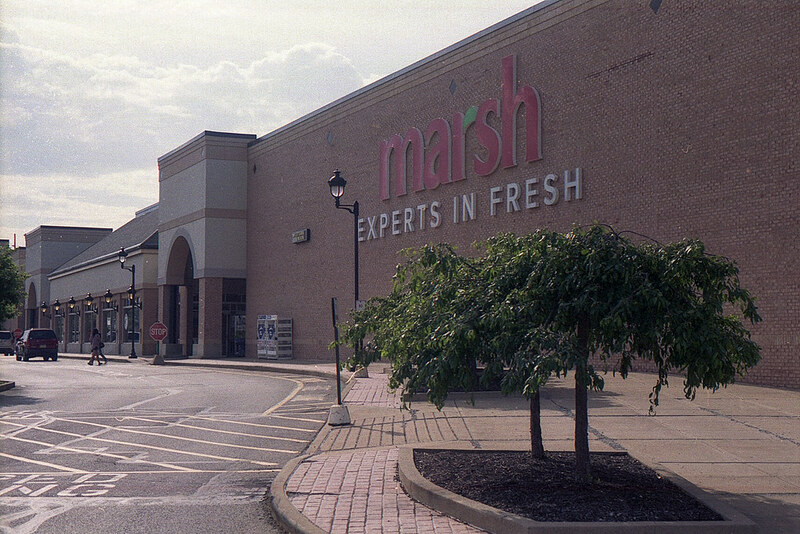 This is one of the Marsh Supermarkets that didn’t get purchased after the company went bankrupt. It and all the others closed for good last Saturday. One of my sons worked for Marsh; he’s now unemployed. Given that I personally spread the mulch in the shot below, I can attest that it’s not actually red-brown. It’s more black-brown. 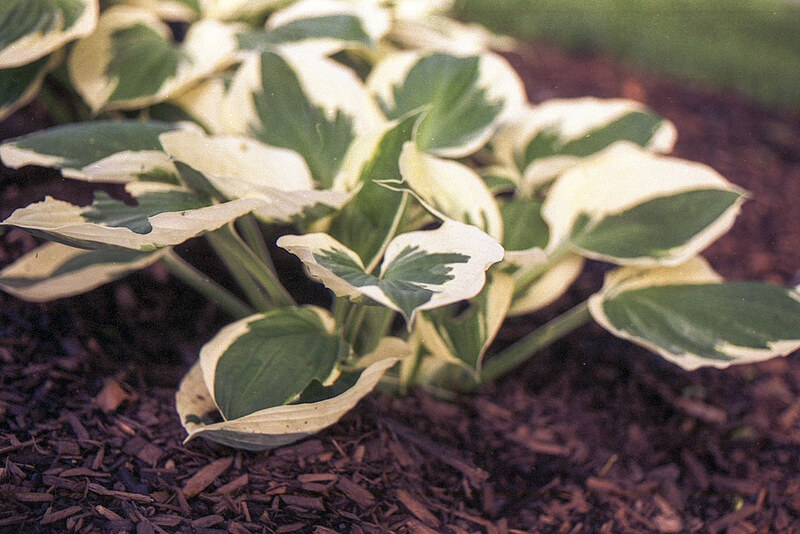 But the hosta leaves are the right colors. Dan suggested slight overexposure of this film to bring out its best, and in these last two shots I can see why. I had to bring up the shadows in Photoshop to make them usable. And in the shot below I got that weird glowing effect on my hedge trimmer. I’m sure there’s an official photographic term for that effect; if you know it, enlighten me in the comments. 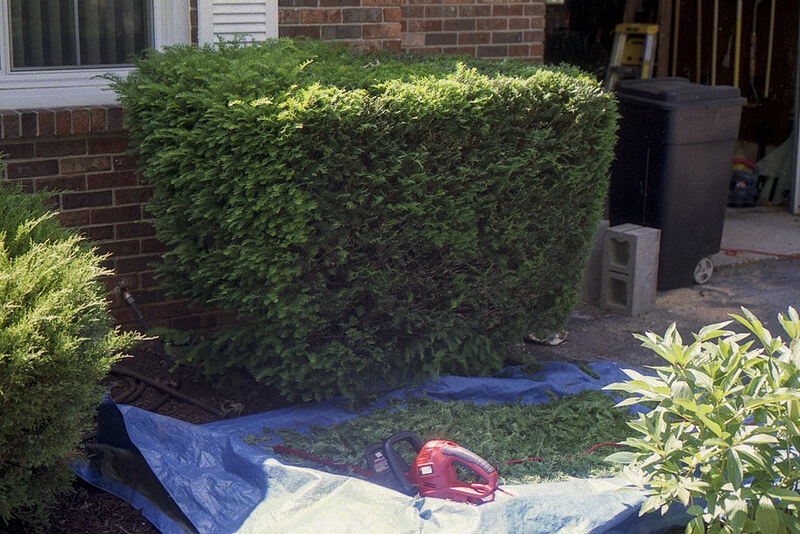 By the way, trimming my hedges is my all-time least favorite home-maintenance job. Ah, for the days when Fujifilm offered a complete range of consumer-grade films. They were all very good for the money. Thanks, Dan, for giving me a chance to shoot this one. I also found a kodak 35 range finder i believe its from the early 40’s lol i am a afraid to try and shoot it. Do you have any knowledge of rhis camera? I’ve seen this camera but have never owned one. I’m sure if you search around on the Web you’ll find a good how-to or review about using it. Good luck! Back in the day, I used to love Fuji Reala 100. Shot miles of it in my N90s. That’s essentially the same film, right? I can’t keep track of all the (former) Fuji emulsions and how they are alike/different. 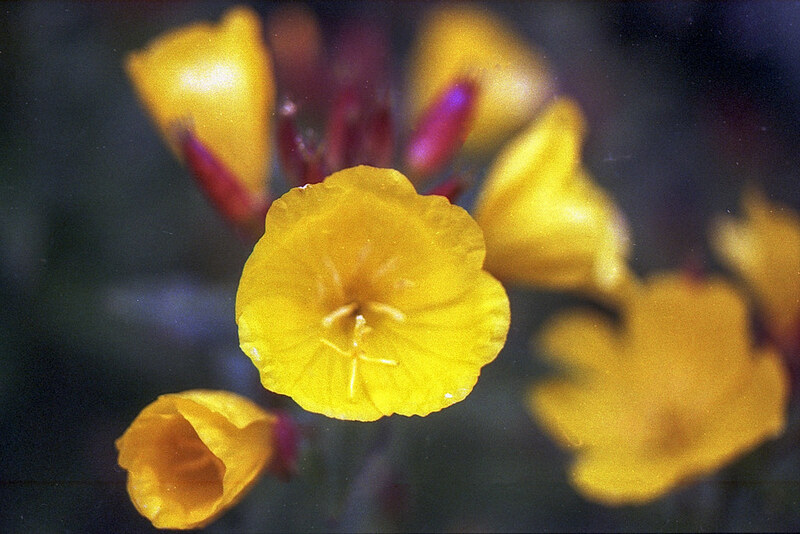 I’ve used a few rolls of Reala 100 too, and in my experience it looks very similar if not identical to Superia 100. Some nice close-in work there with the Nikon. Wish I had some wisdom to offer about color fidelity. I’ve always used an old light version of SilverFast and get little consistency. I end up playing with the color balance on nearly every shot. I’d guess about 90% of my color work has been done on Fuji 200, mostly purchased at Walmart. On my last two visits to the store there has been just a single four-pack on the shelf. I bought both. I love the yours photos Jim and the vivid colours, never tried Fujifilm Superia 100 but I use Agfa Vista 200 all the time I have about a 100 rolls of it I think it produces amazing colours for the money T’is a shame that Poundland have stopped selling it. It is a shame that you can’t get good £1 film anymore! But as prices naturally rise, it was just a matter of time before Poundland had to give up. Jim, great to see this post! Thanks for the mention. I noticed on some of your images, especially the flowers ones, there seem to be a lot of artefacts visible, especially in the background. 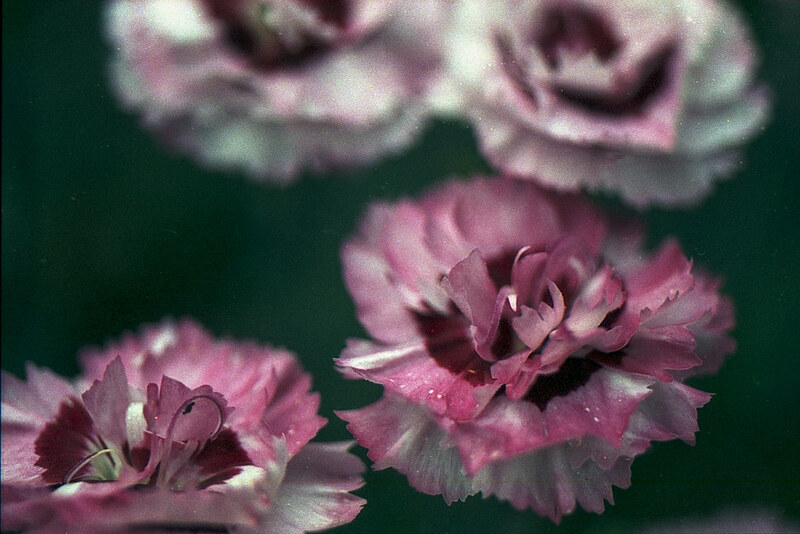 For example the top half of the dianthus photograph and the yellow flowers photograph above that. I’ve never noticed this on your images before. Did you use a different lab with this roll? I’m wondering if this might explain some of the inconsistency somehow? The Marsh and hosta shots look like the kind of muted and shifted colours I’ve seen with underexposing. Maybe try shooting the other roll a stop over exposed on a camera whose meter you really trust and see what happens? With the latitude of film you’d even get way with a couple of stops over, maybe worth experiment with shooting part of the roll at ISO25 too? I hope you get another few keepers at least with the second roll, looking forward to seeing! Dan, whenever I scan myself I have to deal with dust and scratches. This roll seemed worse than normal, but there’s always some to deal with. The lab I used is a very small one, and they are just getting their legs back after a very bad storm destroyed both of their processing machines, which were running as lightning struck. So maybe they are still figuring out quality control on their new machines. I prefer to pay someone else to scan my film, but via mail order that gets expensive fast. The last three rolls I had processed, I took to the camera store downtown and paid them to scan the negs — $8 for processing and scanning isn’t bad. My favorite mail-order lab charges $16. The downtown camera store isn’t too terribly out of the way thanks to my new job’s commute and so I’m likely to use it more often. 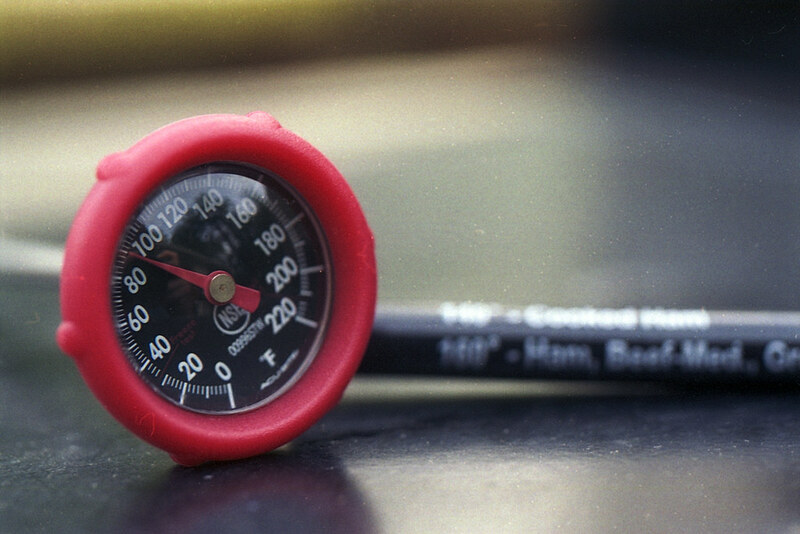 My Nikon F3’s meter has always been pinpoint accurate — it’s why I chose it. I’ll shoot the next roll in one of my other cameras with a meter I trust. My Spotmatic F’s meter appears to be spot on. But perhaps also I’ll shoot slightly overexposed. Interesting follow up, thanks Jim. I’m just thinking based on results I’ve seen you get with other film, and my own experience with Superia 100 (from the exact same batch), I think you can be optimistic about getting some more consistently impressive results next time. I like the way you think, my man! Great review! I used to love shooting on Fuji Superia 100 and its predecessors (Super G, Super HG etc). Reala, Superia 200, 400 & 800 are also excellent films. Sadly it looks like Fuji are now only making C200 & Superia 400 in their consumer range… sign of the times..
Yep, Fuji is clear: they want out of film, except for Instax. It’s a shame.